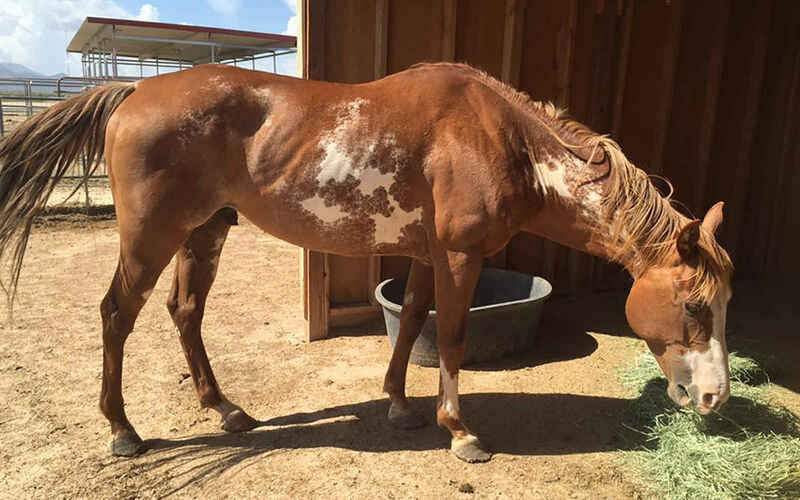 Horse sponsorship is a rewarding way to get involved with rescue efforts and to help horses! "We must never forget… we remain forever responsible for that which we have tamed." Sponsoring a horse(s) is a great way to help when you can't commit to personally caring for one for its lifetime through adoption or fostering. When you sponsor a horse, you are making a recurring donation for the daily care and feeding of the horse(s) of your choice. This is a rewarding way to get involved with rescue efforts and to help horses. You have complete control over the amount of your donation and its duration, and all donations are securely processed through Network for Good. Horse sponsorship also makes a unique gift for a friend or relative. Sponsorship helps give those horses at the sanctuary deemed "unadoptable" the ability to live out their lives in our care — they get a second chance at life. 100% of your donation goes directly to their care and feeding. For our rescue efforts to continue, donations are always needed because the sanctuary is 100% dependent on donations for its survival. When you sign-up to sponsor a horse, you're sending regular donations we can count on. The horses you see in the gallery are permanent residents here at the sanctuary because they are not a candidate for adoption. They, like all the horses in our care, require feed, safe shelter, veterinary care, farrier services, worming, supplements, and maintenance to keep the facilities in good condition on an ongoing basis. We no longer host fundraisers, as we have in past years, due to the shortage of time and volunteers needed to produce them. So, we must depend on direct donations, sponsorship, raffles, official Dust Devil Ranch horse apparel and accessories, calendars and Amazon Smile. Dust Devil Ranch Sanctuary for Horses is a 501(c)(3) nonprofit organization, so your donations are tax deductible. For more information about sponsoring, or any of our other programs, please contact us. For more information about sponsoring, or any other programs, please contact us. Loved visiting the sanctuary with my Mom last month, I am glad to be able to help with the horses care. Great place for these beautiful animals!